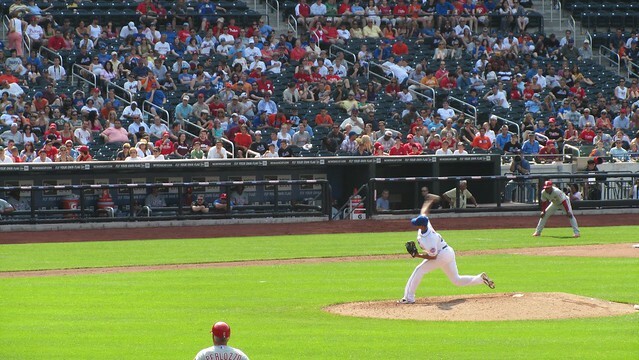 Citi Field: Mets v. Phillies. 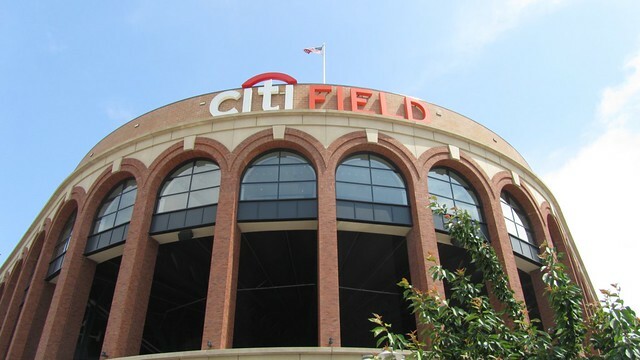 My very first MLB experience came at the all new Citi Field. I won’t pretend that I am an avid baseball fan or that the history of the franchise or even it’s recent murky financial dealings register with me but when I moved here my husband very clearly explained that we would continue to be fans of our Texas teams but since NYC has so many “home” teams we would choose the Mets, Jets, and Nets to root for (if we really had to). So, in that sense I am a Mets fan, I suppose. I do of course like new things and how terrible could a game be, so I sprung for the $90 seats on the lower level the day before the game. Note to future ticket purchasers – they have these great ticket kiosks outside the stadium where you can buy your tickets and/or print them out! No need to wait in the ridiculous “will call line”. We’d been out near the ball park once before when we went to see a friend perform at the Queens Theater in the Park a few months ago so we knew the 7 was a straight shot but we hadn’t walked right up to it. Once we arrived I was taken by how clean and pretty everything was but when I think about it the ATT Center, where the Spurs play is also highly manicured so I guess that’s where all the ticket money goes? not a cloud in the sky at the game! 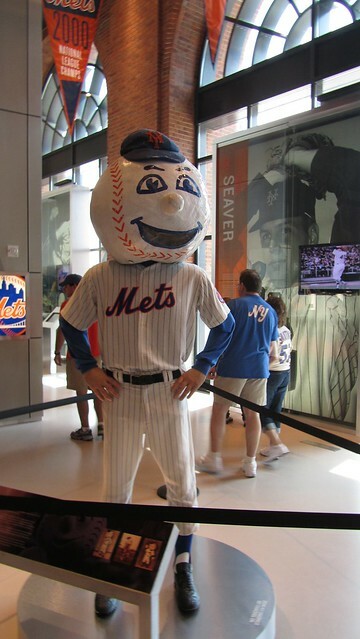 Mets mascot statue inside the museum/store. 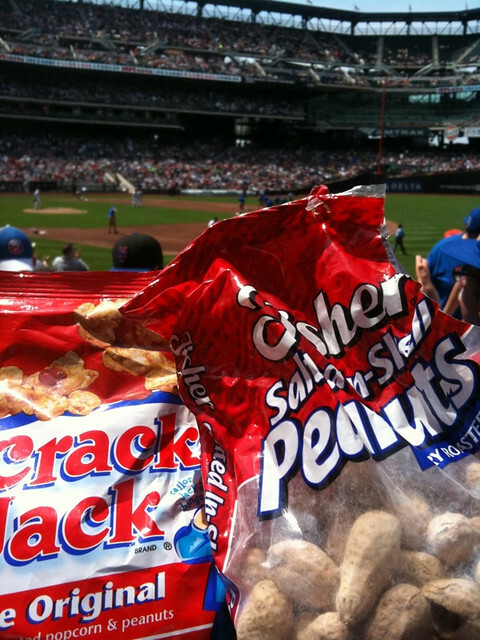 I was sure to wear a blue shirt and pack a full tube of SPF 70 – what else do you need at a baseball game? I did suggest a blanket but Paul quickly explained that we’d have seats and not be sitting in the outfield. 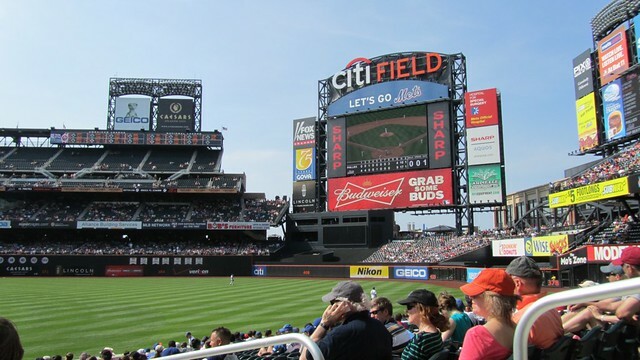 I remember going to minor league games and we always sat on the grass – apparently major league is different. Upon entry the men and women were broken into different lines to be frisked by the appropriate gender of security guard. Needless to say there were 2 people ahead of me in the women’s line and about 20 ahead of Paul. There was a nice little museum to the right of the main entrance which slyly transitioned into the team store where Paul quickly chose a new hat and I opted for actual team paraphernalia (new Alyssa Milano branded v-neck t-shirt and hat for me). We wandered around the museum, store, and the stadium for a while before the game. It seemed like a lot of people just liked to hang out at the game. The stadium offered a wide variety of food options from Nathans, Shake Shack, BBQ to fresh whole fruit and salads at a little market that didn’t seem to be getting as much foot traffic as the greasy options. 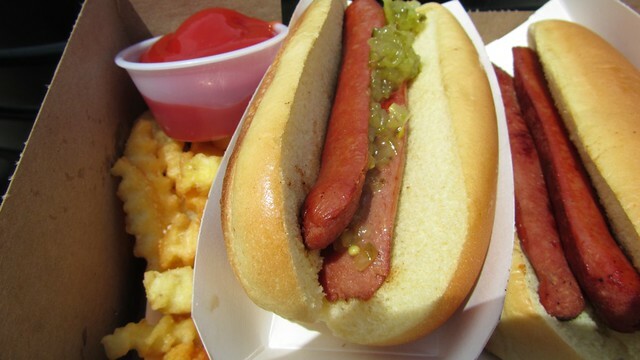 We had the obligatory hot dog but rather than choosing one from Nathan’s Paul got the flat top dog from Shake Shack and I had a burger. It was nice to have a legitimately delicious and well crafted food option on site. I was also super surprised our tickets granted us a server who handed us a menu and offered to bring us anything rather than having to miss one electrifying second of the game. I might be embellishing but only about the game being electrifying. We also couldn’t pass up the opportunity for when the Cracker Jack & Peanut guys came around but the real champion was the Italian Ice! We each had 2! When we finally settled into our seats I was shocked at how close we were to the players on the field going through their pre-game routine. 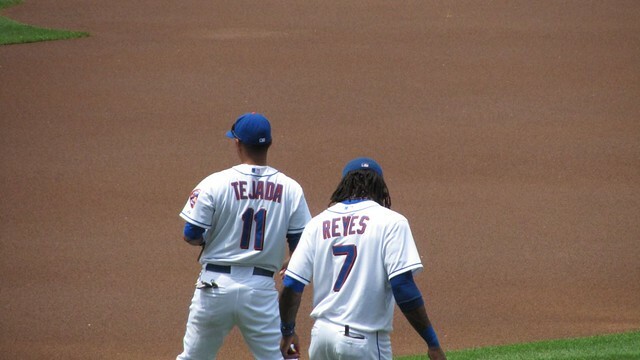 A little girl behind us had made a poster for her favorite player, Reyes I think. Anyway after her mom egged her into going to the 1st row to wave it at him and get his attention I started to suspect he was really her mom’s favorite player. When the girl got embarrassed and came back without an autograph her mom wouldn’t let up until they went down together. Lots of people were doing this and the players were actually responding. I’ve never seen this happen in the NBA – generally the security guards will use force to keep you away from the players – that’s just my perspective though, maybe there are opportunities at NBA games but my guess is they are only granted to those with pockets deep enough to afford floor seats. It was a day game and the clouds were not on our side. we baked under the sun and although I applied layer after layer of sunblock and eventually covered my arms with a shawl – I still tanned. Paul kept offering to have us move up into the shade for a while, if our seats had been like 10 rows further up we would have been in the shade! I finally gave in around the 6th inning and it was like I walked directly into an air conditioner! the stadium seemed to form some kind of natural vent that sucked air in. Note to self, next time go to game with someone in a wheelchair – those look like the best seats in the house. We didn’t get on the kiss cam, which would have made my day but I also didn’t fall asleep! The game was exciting in that we were winning the whole time so the crowd was always positive. Nothing worse that a New York crowd turning on their team. Around the office the sports fans very quickly turn on their teams/players when the chips are down. It’s sad really but the kinds of things I hear are: “he’s a bum,” “he’s worthless”, “he only cares about himself”, “they are a bunch of bums” and of course the language gets much more colorful but you get the idea. I don’t really understand that – why trash the team you are rooting for or the players? Again – I am by far not the sports cornucopia I joking tell Paul that I am but I wouldn’t turn on my team because they are having a bad day. Like before Sean Elliot announced he needed a kidney transplant, he wasn’t playing as well as normal during some of the 1999 playoff games and I distinctly recall talking to Paul about it during the playoffs. We both immediately suggested he must not be feeling well and there was no way he would give it anything less than everything unless he just absolutely couldn’t. As it turned out he was a rock star for even playing in his condition. We all remember the Memorial Day Miracle but now many Memorial Days later, Sean Elliott was the real miracle. I digress but to tie it all together I should mention that the game was Memorial Day weekend and that the Spurs beat the Knicks that year! 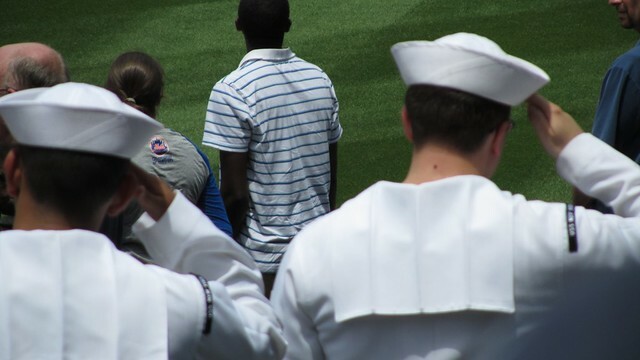 sailors saluting the flag for the national anthem. Paul and I joked that they were doing lots of “fly overs” in honor of the holiday because we were so close to the airport so commercial aircraft were constantly passing overhead. In the end it was a good day despite the new tan lines – Yankee stadium is now on the agenda. This entry was posted in everything i've blogged, food, locations and tagged dining out, Firsts, Queens, weekend adventure. Bookmark the permalink.